Researchers from Tsinghua University, China, and Drexel University, U.S. created a scaffold of proteins coated in cervical cancer cells. 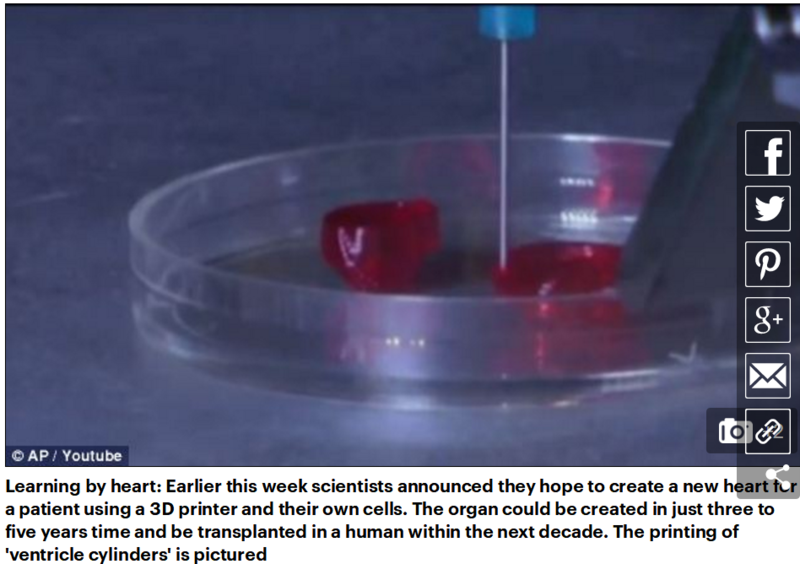 It has only just been announced that scientists are working on printing a heart using a patient’s own cells and now a 3D model of a cancerous tumour has been created using a 3D printer. The model, which consists of a scaffold of fibrous proteins coated in cervical cancer cells, provides a realistic 3D representation of a tumour’s environment. It is hoped that it could help in the discovery of new drugs and cast new light on how tumours develop, grow and spread throughout the body. A group of researchers in China and the U.S. created a model of a grid structure that measures 1cm squared and is made from gelatine, alginate and fibrin to recreate the fibrous proteins that make up the extracellular matrix of a tumour. The grid structure is coated in Hela cells - a unique, ‘immortal’ cell line that was originally derived from a cervical cancer patient in 1951. 3D printing is already being used in medicine. Researchers have used the technology to make splints, valves and even a human ear. So far, the University of Louisville in Kentucky has printed human heart valves and small veins with cells. The team has also successfully tested the tiny blood vessels in mice and other small animals. Professor Williams, of the Cardiovascular Innovation Institute, believes scientists will be able to print parts and assemble an entire heart in three to five years. Due to the cells’ ability to divide indefinitely in laboratory conditions, the cell line has been used in some of the most significant scientific breakthrough studies of the past 50 years. Although the most effective way of studying tumours is to do so in a clinical trial, ethical and safety limitations make it difficult for these types of studies to be carried out on a wide scale. To overcome this, 2D models, consisting of a single layer of cells are created to mimic the physiological environment of tumours so that different types of drugs can be tested in a realistic way. 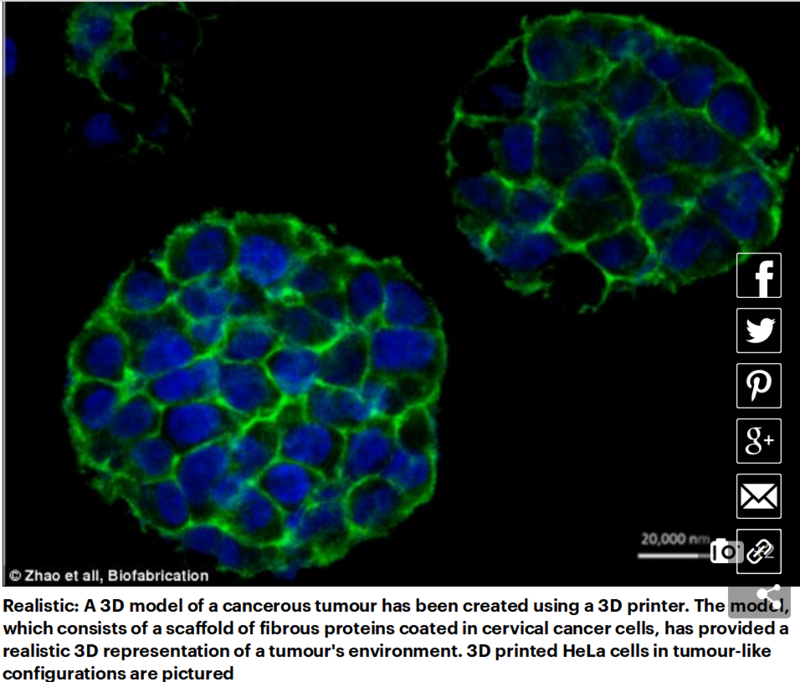 But now scientists can make a more realistic representation of the environment surrounding a tumour using 3D printing. In the study, the researchers proved that the cells were alive after printing and examined how they proliferated as well as looking at their resistance to anti-cancer drugs. The proteins studied were part of the MMP protein family, which are used by cancer cells to break through their surrounding matrix and help tumours to spread. Resistance to anti-cancer drugs, which was also studied, is a good indicator of tumour malignancy. The results, which were published in the IOP’s journal Biofabrication, revealed that 90 per cent of the cancer cells remained viable after the printing process. The results also showed that the 3D model had more similar characteristics to a tumour compared to 2D models and in the 3D model the cancer cells showed a higher proliferation rate (the time between cell divisions) and higher resistance to anti-cancer drugs. The lead author of the research, Professor Wei Sun, from Tsinghua University, China and Drexel University in Philadelphia, U.S. said: ‘We have provided a scalable and versatile 3D cancer model that shows a greater resemblance to natural cancer than 2D cultured cancer cells. ‘With further understanding of these 3D models, we can use them to study the development, invasion, metastasis and treatment of cancer using specific cancer cells from patients.